adopted at the 1977 session of the World Constituent Assembly and revised at the 1991 session. The World Parliament is a democratic, non-military, federal world government, which can solve world problems peacefully and administer those affairs which transcend national boundaries for the benefit of humanity everywhere. House of Peoples, elected directly by the people equally from 1000 World Electoral and Administrative Districts. House of Nations, appointed or elected by national governments. House of Counsellors of 200 elected by the other two houses, chosen for global perspective; has nominative, consultative, initiative and referral functions. WORLD EXECUTIVE, elected by and responsible to the Parliament. Presidium of a rotating president and 4 vice-presidents, all M.P.s, nominated by House of Counsellors. Executive Cabinet of 30 ministers, all M.P.s. The World Executive may not veto or suspend the Parliament or the Constitution. 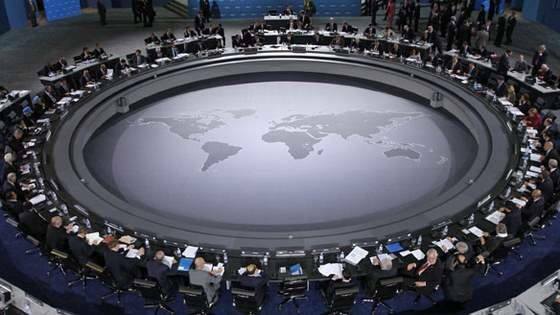 WORLD ADMINISTRATION, of about 30 departments, each headed by a Cabinet Minister or Vice President; coordinated by a Secretary General chosen by the Presidium and confirmed by the Cabinet. WORLD JUDICIARY, composed of 8 Benches having mandatory jurisdiction over different kinds of issues, with 5 continental seats. Collegium of World Judges is nominated by House of Counsellors and elected by Parliament, headed by a Presiding Council of 5 members which assigns judges to the several Benches. THE ENFORCEMENT SYSTEM, non-military, is headed by an Office of World Attorneys General and commission of 20 Regional World Attorneys, elected by and removable by Parliament. The World Attorneys appoint the World Police (removable by the Parliament) to apprehend individual lawbreakers. FIVE WORLD CAPITALS, to be established in 5 continental divisions, one is the Primary Capital, the others are Secondary Capitals. VIABLE AGENCIES OF THE U.N., are transferred to the World Government.